2016. Just hearing this number brings memories of pain and suffering, a result of the terrible year that it represents. Thankfully for us anime fans though, we didn’t see this trend continue with the hobby we love: 2016 was a great year for anime, blowing us away with amazing experiences, wonderful experiments and more. Here’s what I thought were the best this year. While there was a lot of great anime this year but I have to say, this year was bizarre for anime. I’ve been watching anime seasonally for the past 4 years, and they usually followed a rather predictable cycle: Winter with a few good shows but VERY STRONG shows at the top, Spring with a boatload of good shows, summer being pretty average, and Fall being full of the blockbuster shows of the season, but this year.. well a few went along with the cycle, others said NOPE. Winter and Spring were on point, being some of the best anime seasons I’ve had the chance to experience, but the other 2, were some of the most lackluster. I’d have to say overall it was a good year for anime, but like the rest of the year, definitely bizzare. My rules of this list are simple: if it aired/released this year, it can go on this list. I don’t see the point in only giving a show one chance during it’s airing season, and this is my list so I’ll list my favorite shows regardless of what season it started on. If this means that one show hogs the top spot for 2 seasons, than good for that show! If it’s an OVA or movie that came out during the duration of the season I fell in love with, then it may be there. Also, I think that the seasonal split is arbitrary and unnecessary, so it’s completely gone here. Sorry about that, but that’s how I’m doing it. 9. KonoSuba: God’s Blessing on This Wonderful World! Justification & Thoughts: Yes, this is a leftover from Fall of 2015. Do I care? Not at all. This wouldn’t be my list without some sports anime and this was absolutely one of my favorites I’ve seen, one of the best anime of the year. Ace of Diamonds, while slowly progressing through its games this season was consistently exciting, consistently one of the best watches in anime, and I was consistently excited to go and watch it. Nothing beats that, and I hope we get more Ace in the future. If you couldn’t tell from my Ace description above I really love sports anime, and Haikyuu has been an integral part of my sports anime experience. With 2 appearences this year (the reason it edges out Ace) and every episode being as hype as it could be with some of the best animation sequences you can think of, Haikyuu was a show to beat, one that would provide an amazing viewing experience as I watched it. I loved it to bits (even though I already knew what was gonna happen because I read the manga! yay). Justification & Thoughts: With ReLife, the question of “What’s my favorite show of the season” was over before it even began (consider it an Honorable 1st Place). Crunchyroll, for some odd reason, decided to release this show all at the beginning of the season, and I love them for it, enabling me to marathon a show that perfectly matches my preferences. I’m a sucker for romantic dramas, and to see one of them done so well in this fashion is something I really enjoyed. ReLife, more than anything, is about life, giving one a second chance while looking at what makes this tick, and this fuels a thrilling ride of character interactions that allow the viewer to get more and more attached to the cast as they watch. Along with that, ReLife has a great cast of characters with fascinating personalities, and plus, it’s funny, keeping the show always engaging to watch. Definitely a great time, and I can’t wait for more. Justification & Thoughts: Yes, my number 2 of this year is the best movie everyone except you have seen. When the internet started to sing it’s praises over the glory of Kimi no Na wa, I wasn’t the slightest bit surprised. That is, because during AX 2016, I was able to watch the world premiere of this movie and my mind was completely blown. While I always appreciated Shinkai’s works, I would be what most would describe as a Shinkai Skeptic because I would generally paint a negative picture on them when I talked about them. This is because I never really was engaged with them and the story they had to tell, but Kimi no Na wa... had my crying in my seat. Every moment was engaging, every moment was beautful, and most importantly, I was actually enjoying it, unlike so many of his works. This is one of the best anime movies ever made, and it’s easily one of the best this year has to offer. Definitely check it out when you have the chance. If you’re interested in reading more thoughts about Kimi no Na wa, check out the AniTAY review! 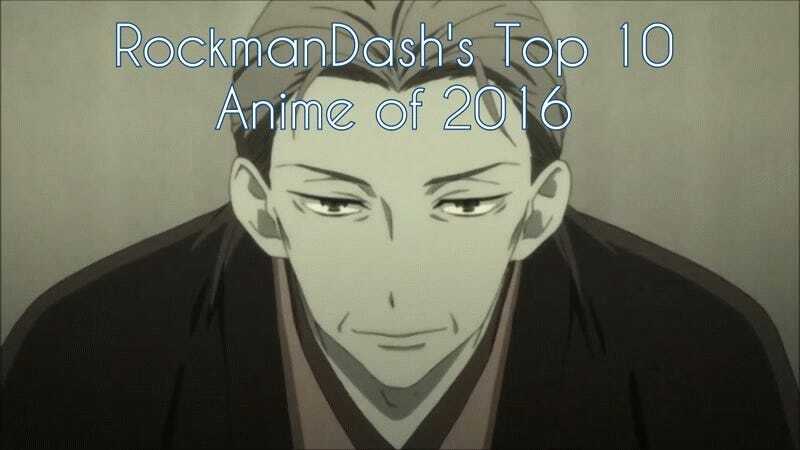 Justification & Thoughts: When talking about how great Rakugo is, where do you even start? There was never a doubt in my mind that this was my anime of the year, it’s a fantastic show that (in my opinion) contends with the best I’ve seen, a show that ticks all my boxes by telling an interesting historical story on the decline of the art form of rakugo and the tale of our interesting characters that are fleshed out and feel real. While the plot of Rakugo may sound boring because it’s literally about telling stories, it is the execution, how it tells the story that makes this great, being able to handle all of its elements extremely well. The show has fantastic pacing, solid visuals, a great score, amazing characters and the best part: it’s consistently engaging with every episode being better than the last. It’s definitely a must watch, my favorite of the season. my favorite for the year, and one of my favorite anime ever. It’s a timepiece that displays a story of the past extremely well, and a shining example of what shows like this should be like. I never thought I’d say this, but well played Studio Deen, can’t wait for more in a few weeks.